The Llama trademark was registered in 1932 and pistols started to appear in 1933. 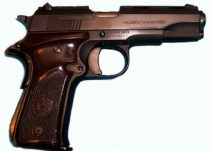 There seems to have been a desire by Gabilondo for a clean break with the Ruby brand, given the adverse reputation that wartime Ruby-type pistols acquired (the majority of which, ironically, were not even manufactured by Gabilondo). These were based on the Colt M1911 and later the improved Colt model 1911-A1 model of 1924 but without the grip safety. Very early models were advertised in .45 ACP, 9mm Largo, and 7.63mm Mauser. The Llama IV was the first numbered model to appear, and unusually, it was advertised as having a “tolerant chamber” capable of firing .38 ACP and 9 mm Largo rounds interchangeably. The Llama V was chambered for 9mm Largo 38 ACP, and 38 super, for sale in the US. The Llama VII was chambered for 9mm Largo and 38 ACP and came in two different versions, a regular 5″ length barrel and the Extra with a 5 1/2″ barrel. There are reports of a Llama being bought by the British in 1944 for use by the S.O.E. but which gun cannot be confirmed if it actually happened. Concurrent with the release of these large models, Gabilondo replaced the Danton with the Llama I and Llama II. The Llama I was manufactured from 1933 to 1954 and resembled a miniature copy of Colt 1911 in 7.65 mm/.32 ACP. As a locked breech was unnecessary for a pistol in this caliber, it was eliminated, as was the grip safety. 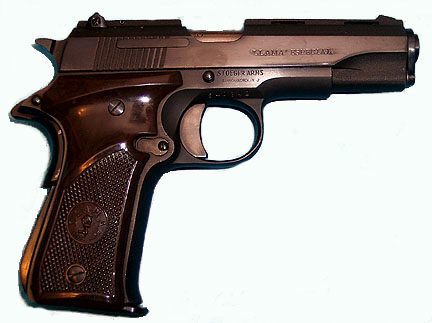 Similar to previous Gabilondo models it had a nine-round magazine. The Llama II was manufactured from 1933 to 1954, The Llama II was chambered in 9 mm corto/.380ACP with an eight-round magazine and without the grip safety. The Llama III was introduced with a grip safety, locked breech and continued to be made until 1954. It was made in the same caliber and magazine capacity. Refer to http://www.carbinesforcollectors.com/llamapage.html for accurate pictures of the guns. Llama never made a Stainless Steel gun as some report them to be, they are all chrome plated either bright or Satin.